Please email: info@oliverscandies.com for rates to ANY international destination. We ship globally! All of our packages are shipped via USPS Priority Mail. We do offer the option of USPS Priority Mail Express which is a 1-2 day transit depending on the area being shipped to. Warm Weather Shipping - Reusable gel packs are $1.75 each. Chocolate shipments to climates over 70 degrees Fahrenheit cannot be guaranteed against melting even with gel packs included. We do however guarantee your shipment when using a gel pack and shipping via express mail. We will do our best in shipping your order, but cannot control if your package is left on the doorstep or in a warm condition for a lengthy period of time. 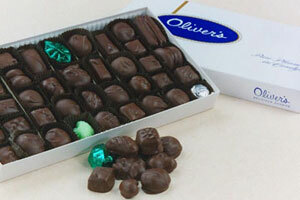 Refund Information - Oliver's Candies is made fresh and shipped in top quality condition. If for any reason you are dissatisfied with our product, please let us know so we can correct your problem or refund your purchase price. Free shipping on orders of $50 or more is only available for online orders! If you are ordering over the phone, this promotion is not valid.